Sandvik Mining and Construction is part of the Sandvik Group a global industrial concern with advanced products and world-leading positions in key areas. 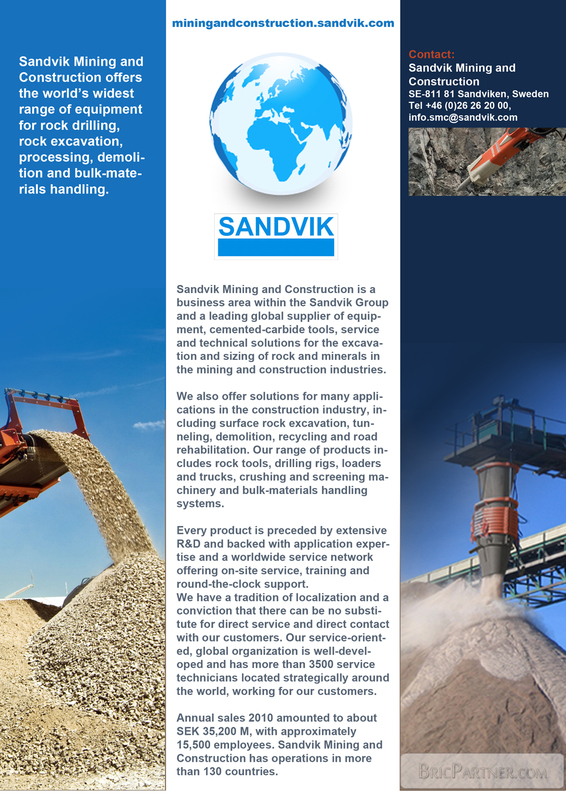 Sandvik Mining and Construction is a business area within the Sandvik Group and a leading global supplier of equipment, cemented-carbide tools, service and technical solutions for the excavation and sizing of rock and minerals in the mining and construction industries. We have a tradition of localization and a conviction that there can be no substitute for direct service and direct contact with our customers. Our service-oriented, global organization is well-developed and has more than 3500 service technicians located strategically around the world, working for our customers. Annual sales 2010 amounted to about SEK 35,200 M, with approximately 15,500 employees. Sandvik Mining and Construction has operations in more than 130 countries.